Agate is a rural area east of Shelton on the opposite side of Oakland Bay. Just off Hwy 3, Agate is full of wooded space and farmland; homes for sale here are ramblers, craftsman, and custom styles on small to large acreage. Some residents may have bay views and their own slice of beach. Despite its remote feel, Agate is less than 20 minutes from downtown Shelton. 3 Beds | 1.75 Baths | 2668 sq. Ft. Vacant lot in Shelton near the water. Uncleared lot with paved road access. Located 6 minutes from Latimers Landing public boat launch. 3 Beds | 3.5 Baths | 3138 sq. Ft.
1 Beds | 192 sq. Ft.
| 0.5 Baths | 3100 sq. Ft.
3 Beds | 2 Baths | 1920 sq. Ft.
1 Beds | 1 Baths | 844 sq. Ft.
Blue Summit Realty has the most accurate and up to date Agate real estate listings on the web. Currently there are 6 homes for sale, and 32 vacant land properties in Agate. Of the 38 total Agate residential listings for sale 0 are bank owned, 0 are short sales, 0 are new construction, and 0 are townhomes. The price ranges from $40,000 to $0 with a median list price of $310,833 and median sold price of $303,214. Make sure to refine your Agate real estate search by property type, price, square footage, bedrooms, bathrooms and more with the search tool above or view the Agate listings on our interactive map. 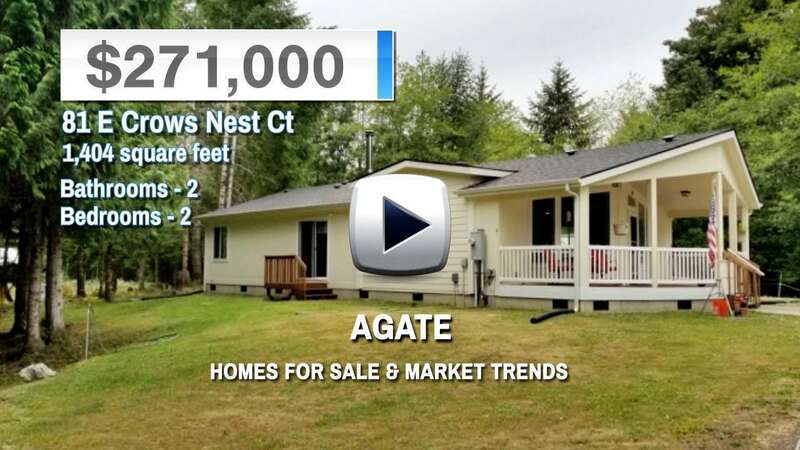 Our Agate real estate listings were updated 7 minutes ago.